Back as a twosome once more, it was good to leave the Turkmen nonsense behind us – here the only restriction was that we were supposed to stop in at a guesthouse every few days to register our whereabouts. We rolled across the border and made the short distance to Nukus feeling relaxed. We stopped in at a hotel and asked if we could camp up in their parking – it was shut in the end, but the one lady we could find said it was okay and for a small fee we could use the showers and washrooms too – perfect. The lady at the hotel made it quite clear she didn’t want to take any US dollars for our stay, and we had not yet picked up any local currency – we promised to return with some more acceptable cash for her, and assumed that she had understood our miming attempt since she didn’t seem to alarmed when we drove off without paying. A quick tour of the local banks showed that we had foolishly arrived on a Saturday, and we would not be squeezing any cash out of them until Monday at the earliest since ATMs have not yet been adopted in the country. At the third of the banks that we tried, we were lucky enough to be greeted in near perfect English by one of the office workers who was just leaving after finishing his morning shift. He explained that if we wanted any money it would have to be exchanged on the black market – we had some dollars with us, so that would work. Attick said that he knew someone who could help, and offered to drive us to the bazaar where this sly transaction could take place. Although this had all the hallmarks of a scam, we also didn’t have an awful lot of choice if we wanted to buy food, fuel, or settle our accommodation debts before Monday. 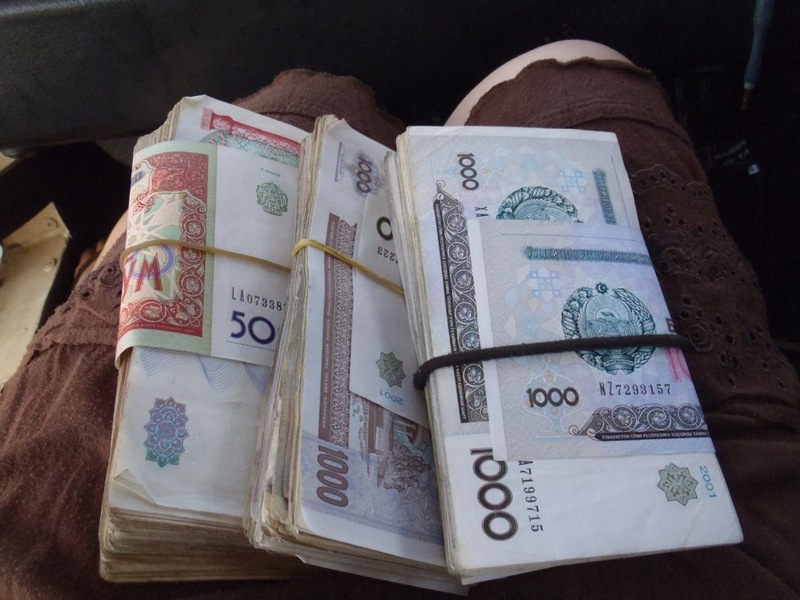 A fool and their money may easily be parted, but in this case they were shortly to be reunited – in the form of Uzbek Sum, and at an exchange rate far better than any bank would have given us. A dollar would have normally bought us 2000 sum, but here we had managed to end up with 2650, all thanks to Attick – who even gave us a lift back to Ivor with our new big bundles of cash. We were yet again impressed by the locals’ generosity; taking take time out of his day to run us around and negotiate on our behalf. Debts settled, we made our way to our next stop at Khiva, an ancient city of the silk roads which had also played its’ part in the great game, and which had up until the late 1800’s remained under the rule of a string of ruthless khans. A large amount of the old city has been routinely destroyed by its’ various occupiers, and has suffered at the hand of everyone from Genghis Khan to the Russians – who, to their credit, more recently put considerable effort into its’ restoration. The old walled city as it stands now is a world heritage site, and an impressive one at that. So the story that goes with this minaret is that it was never finished… since the architect was lured to Bukhara to make the Khan there an even taller one. The Khan of Khiva was a little miffed about this, and sent his men to fetch the troublesome designer. As punishment, the architect was thrown to his death from his own unfinished work in Khiva – but ironically, the tower was not tall enough, so it took three attempts for them to finish the job. As useful as our Garmin at times. We managed to find a hostel inside the city walls that allowed us to park outside and make use of their facilities free of charge. They spotted that we were on a tighter budget than a lot of tourists that come through their doors, so when we ate dinner at their restaurant were only charged half that of another couple sat at an adjacent table. It was a family run affair, and the nephew, known to us as ‘DJ’, even invited us out for drinks with him and some friends that night. Unfortunately we missed DJ that night, but we had good reason – we’d managed to get caught up in a local celebration. Our arrival had coincided with a public holiday ‘children day’, so when we went to investigate where some music was coming from, we found a group of locals dancing and playing instruments in the street. Kim’s hand was soon lead into the dance by a smiling old lady in traditional dress, and when the music stopped glasses of vodka were quickly placed in our hands, and food offered to us. We did not stay long, politely turning down many offers to refill our glasses, but it was just enough time to miss DJ heading out for the evening. A shame since it would have been a good chance to have a local guide for a night out. His uncle and owner of the hostel, Rashid, tried to call DJ, but to no avail – so we picked up some beers from a local shop and spent the evening chatting to Rashid instead. 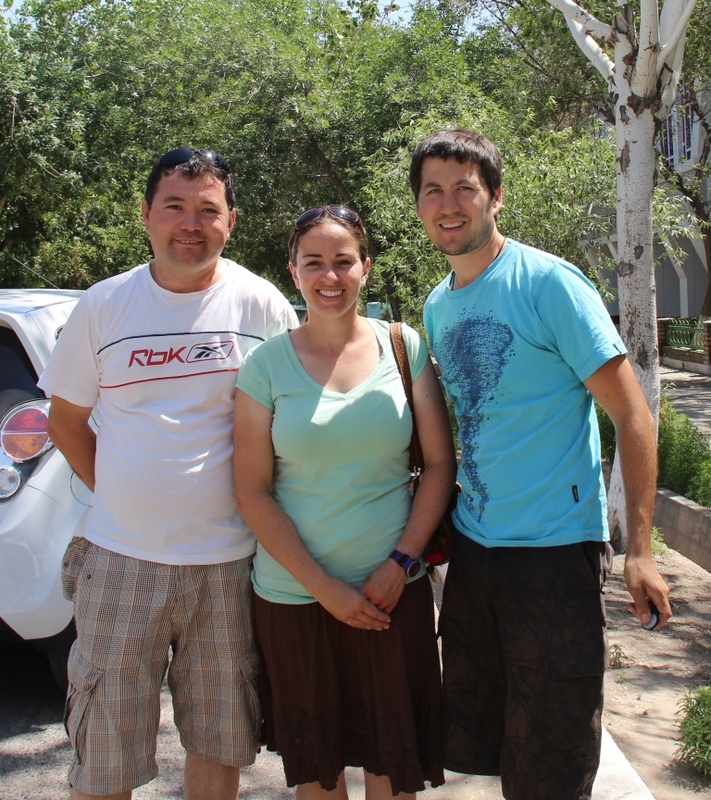 He was a very open and honest man and we were given an insight into the area and Uzbek culture from him. We moved to park outside a B&B just outside the city walls where Rashid had said it would be cheapest to register for us – they were prepared to cut us a deal if we slept in the truck outside. We then set about exploring the city in a little more detail. We foolishly bought day tickets to allow us in every single one of the attractions – most of which were a little sub-standard, sometimes hilariously so – the “Nature Museum” was essentially a collection of bad taxidermy, and if the crooked necks and misplaced wings were not enough in the final exhibit they had somehow not managed to lay their hands on a real goat, so had made do with a childs’ plastic toy. After a lunch of fresh fruit bought straight from the local bazaar we rested at the B&B to get out of the midday sun. A real highlight of Khiva came later in the day when we climbed the old watchtower, to get a grand panorama over the city in the beautiful evening light. That night we dined at the B&B with some fellow travelers. The dish on offer was plov, a specialty of the entire central Asian region – in most cases it is just rice cooked up with some veg and some fatty meat on top, and although this was to prove no exception it was at least a cheap reliable fill up. After Kim had made Skype call home it was bed time – a long day to come tomorrow. A long drive today, continuing the lonely planet city hop through Uzbekistan. We would be making the journey from Khiva to Bukhara, which involved crossing the Kyzyl Kum dessert – it would be another toasty one for sure. We started out with some terrible roads / tracks as we weaved our way back to a highway where things got a little better. The road wasn’t exactly finished and the surface alternated between sections of perfect tarmac and those of deep sand – fortunately for our progress there was a good deal more of the former. Did we mention the desert? It’s big. As we rolled into Bukhara in search of a guest house, Ivor felt it was time to act the spoilt brat – having not been getting much attention of late it was now that he’d decided it would be a good idea to give up on running at tickover. This meant that to keep him running it was necessary to keep one foot on the accelerator at all times – the upshot of which is that the driver never had a spare foot so that the clutch brake could be applied at the same time. It is probably stating the obvious to say that driving a large truck in a new city, when you don’t know where you’re going, the drivers are all insane, and you can no longer come to a complete stop without either using the handbrake or stalling is not that much fun. 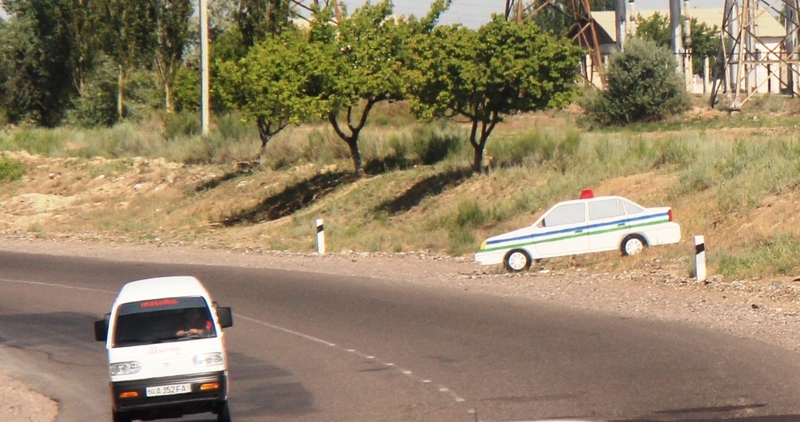 In Uzbekistan, if you want to move people, you use a Daewoo Mini-van. In Uzbekistan, if you want to move stuff, you use a Lada. One guesthouse that we did manage to find wanted 30 dollars just to park outside, get registered, and take a shower. That seemed a little mad given that the night before we’d paid just 12, so we continued our panic stuck drive around the city until we, after stalling one more time, managed to roll to a stop in a parking lot. After a dinner of shashlik and a well deserved beer we sloped back into the truck putting off our registration for another night. We went to bed hoping for an easy fix to Ivor’s problem but knowing deep down that tomorrow could well be a busy one. Ivor had started playing these little games towards the end of Turkmenistan, but up until now the hiccups had been ignorable. The first step was to change the fuel filter in the hope that it would just be full of crud or water from the bad fuel. No such luck, but on re-bleeding the system we just could not manage to get rid of all the air. In doing this, the thread on the bleed screw stripped, so could no longer seal. A bad start; we were going to need a machine shop to get out of this one. We sent some local kids to get a mechanic, who arrived a short time later with his son to try to lend a hand. And within a couple of minutes the part was stripped from the truck and we were in the guys car in search of a drill, tap, and larger bleed screw. After bouncing our way through endless unpaved backstreets we were lead into a small machine shop – the part was fixed very quickly, and they would not take any money for the work. Gratefully we hopped back into the car and made our way back to Ivor. One problem solved, but we still had air appearing in the fuel lines to worry about. We suspected the lifter pump (that delivers fuel from the tank to the engine), and had a spare. So fitted the new component, but the fuel lines were still blowing bubbles. We made many more attempts to incriminate different components in the supply. After several hours, and the help of a few more locals, we narrowed it down to the switches used to swap between the two diesel tanks. With the switch taken out he finally behaved as he should, but we had halved the distance between fill-ups since we were now down to just one tank. The mechanic had been with us for the best part of the day and only asked for 20 000 sum (less than 8 bucks), as a thank you we gave him 30 000. He had clearly been in a position to demand far more, we’d gotten lucky with the locals again. We decided to stay in a guest house, to register and get a good night’s rest after a stressful day. A good ole lie in, a filling breakfast, and some sightseeing for the day. We black marketed some more cash and went off to see the city – including a stop in to see Sharif who we’d met the day before after he’d come over to see our stricken truck, and then paid for a taxi when he took Vaughan off on the search for some fuel line. He worked as a jeweler in the Ark, one of the main tourist attractions. At the ticket gate we just mentioned his name and were allowed in free of charge. He gave us what seemed a good price for some handmade sliver earrings for and a ring that Kim could wear as a faux wedding band. If you displeased the Khan of the era, you would meet your sticky end after taking the quick route down from the top of this minaret. It was this very tower that the architect of the stubby minaret in Khiva sneaked away to work on, leading to his eventual, erm, downfall. As the day was getting on we decided to move on from the town – but first we had to make sure that our (remaining) diesel tank was full. 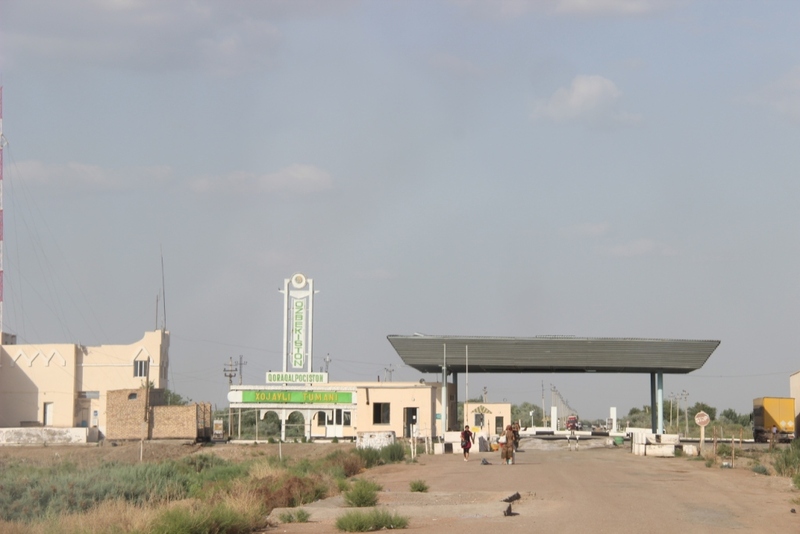 Uzbekistan is not blessed with the fuel supply of its’ neighbours, so when it is in stock there will inevitably be a large queue outside the station – and that’s just for petrol, good luck to anyone searching for diesel. After a good tour of the city, and countless mimed directions from the locals, we found one garage that was willing to serve us. In this country every single price is up for negotiation, even on garage forecourts. In this case we were not in a great position for bargaining, but agreed a price that was at least approaching the national average – having thought that we had gotten away without being swindled that time, the pump stopped suspiciously early, and without any readable gauge on the pump, or any grasp of the local language we were going to be hard pushed to squeeze any more fuel out of these cheeky swines. We tried to argue, but it was only when a policemen who had earlier given us directions showed up that we managed to get a few more litres out of them. Finally on the road to Samarkand it was getting late and it was clear we would not make the whole journey before nightfall. We settled on asking a local in a small village if we could park up outside their house but for the evening. The language barrier hampered this somewhat, but the unsuspecting local eventually agreed. It was only when a kid who spoke some English was sent for that we discovered that they thought they had agreed to us staying in their house for the night! After both parties finally knew what was going on, the local kids all took turn at introducing themselves to practice their English we were presented with a large bowl of freshly collected fruit – A kind gesture that made it much more clear to us that we were welcome to stay. Keen not to outstay our welcome we hit the road early, but before long Ivor was acting the fool once more – this time a roar from the exhaust – the clamp that held the downpipe to the manifold had made a bid for freedom. Vaughan was all set to make a roadside bodge when a couple of goat herders had come to check on us and one of them spotted that the clamp had dropped onto the chassis below the engine – the pair got stuck straight in, and fixed it back in place in minutes while we just stood back and watched! We arrived in Samarkand with enough time to mess about tracking down another guesthouse to register at. Though we had to stay inside we were happy for the internet connection and the air conditioning for a change! The town is beautiful, and we were happy to spend the evening strolling around it. The next country on our itinerary was Kyrgyzstan, the last before crossing into china, and we had learned that there had been some unrest there following some protests at a gold mine. The borders with Uzbekistan have been unstable for a long time, so would be quite likely to close in the result of any sustained problems. We decided that since we were now less than two weeks away from our China entry it would be smart to miss out our visit to the capital city of Tashkent, instead making out way to Kyrgyz border as soon as possible. We stopped on the way out of town to have a new rear light bracket made up that had snapped off in Turkmenistan, and was now held on with a ratchet strap and empty water bottle. After a little haggling over the price and a quick stop in at the bazaar we were on route once more. Seriously, you think people fall for this?! We were the spectacle at a truck stop when we stopped in for dinner and a place to park up for the night – but again, nothing other than friendly faces and people keen to find out what we were doing so far away from our homelands. Driving, and lots of it. With good roads we cruised towards the border with ease, and made it to the Uzbek border town just before sundown. It was here that things got a little interesting for us. We had chosen to attempt to enter Kyrgyzstan at the lesser used crossing near the Uzbek town of Uchkurgan since it was closer to our planned route, and also it neatly sidestepped the troublesome Ferghana valley area, which has been unsettled for some time. The GPS had done more than a fair share of getting us this far, but was not without it’s foibles. In this instance the exact border between Uzbekistan and Kyrgyzstan was not clearly marked – though this is not entirely the poor little Garmin’s fault since the governments on both sides also regularly disagree over its’ exact position. While trying to find the actual border post we turned down a narrow road, and were greeted a few hundred meters down by two gentlemen who had been lurking by a corner of a field, each were bearing guns and different camouflaged uniforms. Neither of us are great experts when it comes to weaponry, but we can confirm that the guns were both of the big and scary variety. The local dialect sounds frightening enough in the most benign of situations, in this case the demands for our passports and that we turned off the engine were unnerving to say the very least. We settled on just the former keeping Ivor running and we nervously handed over the documents. It was a pleasant surprise to get our passports handed back in through the window without so much as a demand for a bribe. The soldiers would not let us reverse to escape the situation, and instead one got into the cab and made us drive further along the road, miming that we could turn around further down, but that he must accompany us. He explained as road turned to track that this very byway was the current border between the two nations, and we had accidentally tried to drive along it. Well done us. Before long we had arrived at a dead end, the track having been blocked with a barricade of loose earth – over which another soldier appeared after we were asked to sound our horn. We were eventually persuaded to turn the truck off, not being in the best of positions for bargaining. After a few tense minutes our passports were again scrutinized and returned to us. Our worries of anything untoward going on were fading a little as time went on, but the sun was going down and the men with guns were still just laughing when we mimed getting the flip out of there. Support had been called for, and eventually a small 4×4 truck arrived containing yet more soldiers and, at last, someone of sufficient rank to decide what to do with us. They reasoned that to avoid us causing them any more grief we should be escorted to the closest border crossing point, and booted out of the country without delay. At last we were free to turn around, and the little truck lead us to the padlocked gates where we could get our papers stamped by the very friendly border guards. 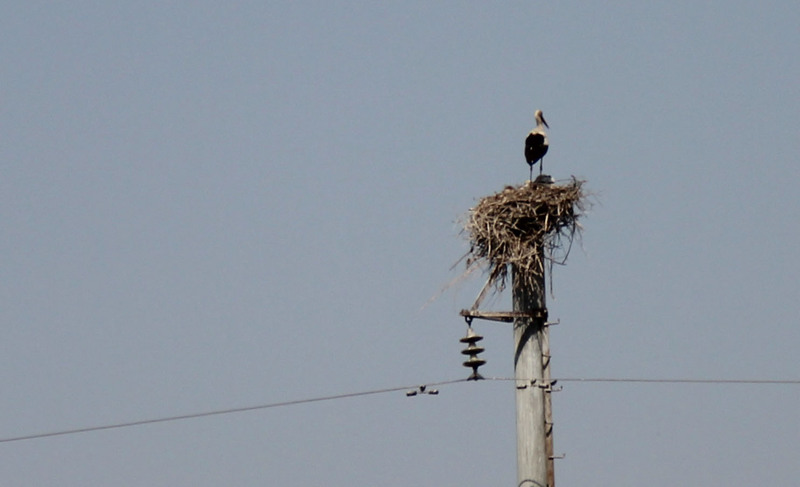 All that was left was to totter across a short section of no-man’s-land and into Kyrgyzstan. What a night. We were relieved to pull up the Kyrgyz side of the border and settle down for the night. We would learn later that the crossing point we had been escorted to is normally closed, and that we had unwittingly avoided a 400km round trip to the next one along. That wrong turn down that tiny road to the soldiers, despite being a frightening experience, had saved us the best part of a day’s worth of driving. Things were on the up. Man alive I would have needed new trousers if that was me! Loving the blog.